First published on August 31, 2015. I’ve been focusing lately on my Husted lineage, partially because that’s the most recent research that I’ve been doing and partially because I have a treasure trove of pictures from that side of the family. However, I started my research, maybe two years ago, by following my last name, Dwinells as far back as a could. You would think that this would be easy because my last name is unique, but because my last name is different, it was spelled so many different ways: Dwinell, Dwinnell, Dwinels, Dwinnells. You get the picture. Some of these variations in spellings are caused by error on the part of the census taker, transcriber or even the part of my ancestors. If they weren’t literate, it might be hard to spell your last name. However some of the variations are due to different parts of the family estranging themselves. I remember by grandmother saying that some parts of the family moved away and changed the spelling of our last name to even further distance themselves from relatives that they didn’t like. Although this created a lot of confusion for me, I was able to uncover a wealth of information about the Dwinells family that goes as far back in America as the Husteds. 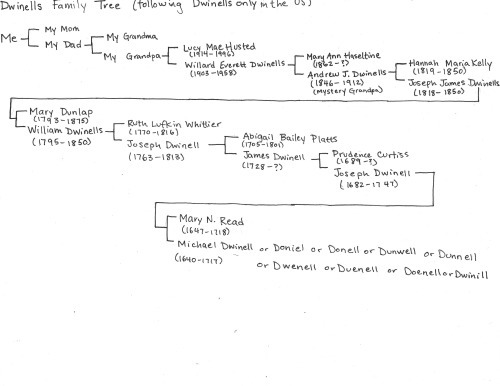 While doing my research, I found that there was a book out there about my family genalogy, The True Genealogy of the Dunnel and Dwinnell Family of New England… by Henry Gale Dunnel, written in 1862. (I also want to mention that Internet Archive is amazing). In his introduction, Henry Gale Dunnel writes that he started his research because of the discrepancies between his father’s last, Dunnel, name and the last names of his uncles, Dwinnell. Henry finds that his ancestor, who also happens to be my ancestor came to Topsfield, Massachusetts in the 17th century. His name was Michael and his last name varied. You can see on the genealogy that I posted, how many different spellings of his last name there are. There is some more information about Michael that I will talk about in a later post. Michael is my eight-times great-grandfather and when I discovered him, as with most of my discoveries, I was amazed. I knew the name of my eight-times great-grandfather. I knew where he lived and some of what he did. For me, that’s a big deal. First published August 29, 2015. Here’s another letter that I found among the pictures left by my great-grandmother. At first I had trouble figuring out who this letter is from and who it was written for. The letter starts off with “Dear Ones” and is signed from L.H. I had originally thought this letter was to Lucy Lamb Husted, my great-great-grandmother but after further review I think that this letter is from Lucy to her children, thus the “Dear Ones”. There are some other people mentioned in this letter, the first is Nate, who I haven’t been able to identify. I’m assuming that Lucy when to visit her mother, Adella Lamb, who she mentions later in the letter, up in Litchfield, Connecticut. I will look more into who this Nate is because I also have many unidentified pictures taken in Litchfield and Nate might be in them. Lucy also mentions a letter from Aunt Kate. This can be Lucy’s sister, Kate Lamb Osborn or Lucy’s Aunt, Kate Lamb Fuller. Seeing as this is a letter to her children “Aunt Kate” is probably Lucy’s sister. Just a line I expected a line from you today but it was Aunt Kate’s in stead. I some times wish you were here there is lots of things toshow you & shure you will never know or rather never relise if I do tell you. I have my mind made up & that is pure & simple. This letter was hard for me to transcribe. It was much lighter than the other letter, making it hard to read. There are some words that I could not figure out some of the words, even by increasing the contrast on the letter. The grammar and spelling mistakes make this a hard letter to read and understand. I like the part of this letter that is clearly a mother making sure her children take care of their home. She gives instructions on how to spray the potatoes and to make sure that the chickens don’t go on the new lawn. She tells them that if it hasn’t rained, to water the grass. I also find it interesting that Lucy asks to “hug Louise for me”. In 1923, Louise would have been just a year old. I feel like it would have been hard for a mother to leave her infant for a length of time. That’s what makes me think that Lucy went to see her mother because her mother was ill. Adella does make a comeback from whatever illness that she has because she lived at least until 1957 and the age of 94. My great-grandmother Mae or in this letter “May” would have been nine years old and her brother Robert, thirteen. Lucy never mentions their father until the very end of this letter “be a good girl that is the kind dady likes”. I imagine a thirteen-year-old and a nine-year-old and a baby running a small farm but that is not likely. Lyman M., Mort as he is called in other letters, Lucy’s husband, probably was home tending to their farm. I would like to know how long Lucy was away from her home, some of the things she talks about makes it seem like she was away for awhile, like how she baked a cake. I also don’t know how long letters took but I’m assuming they weren’t too fast. Overall I think that this letter is an amazing thing to find. I love the fact that my great-great-grandmother sat down at a typewriter and I can hold in my hand the letter that she wrote. I think that feeling connected to my ancestors is one of the main reasons that I love doing this research. Even though Lucy never knew me, I can still feel like her granddaughter, even if it is her great-great-granddaughter. First published on August 27, 2015. Because my last post was so long and took me the entire weekend to research, here’s a small little bit of my family history. Following my Husted ancestry back, I encountered John Mead, who is my nine-times-great-grandfather. He lived in the middle of the 17th century, as far as I know his birthday is unknown, but he died in 1699. John was one of the early settlers of Greenwich, Connecticut. While researching Greenwich, I came across a book called Ye Historie of Ye Town of Greenwich by Samuel Mead. The title sounds like it was written in the middle ages, but it was written in 1863. Not only does it have a good history of the early town, it also includes a genealogy of many families in Greenwich. One day when he was quite an old man, as he was going for his grist on horseback to the mill at Dumpling Pond, before he reached the Mianus River he overtook an old Quaker jogging slowly along loaded with a heavy budget. In a real spirit of kindness he offered to take the Quaker’s load upon his horse, and thus give him a lift on his journey. “No,” replied the Quaker, “thee don’t get my bundle, for I can read men’s thoughts. Thee wants to get my bundle, and then thee’ll run off. Thee don’t get my bundle.” “Very well,” was the simple reply, and so they went slowly on together. At last they came to the brink of the Mianus River. Here the Quaker was really in trouble. How to cross a river, two or three feet deep, dry shot, was quite a puzzle. But he gladly accepted a second offer of assistance from the horseman. The bundle was mounted in front, John in the middle and the Quaker behind. Arriving at the centre of the river, in pretending to adjust his stirrup, John caught the Quaker by the heal and gave him a gratuitous bath. Such treatment was too much, even for Quaker forbearance, and the victim, with his hands full of pebbles, would have taken summary vengeance, had not the other party threatened to put the bundle under a similar course of treatment. This threat, and the lecture following it, gradually cooled off the Quaker’s anger. John informed him that all had been done for his good, to teach him a lesson, and the lecturer said he hoped the stranger would never again profess to read men’s thoughts. “For,” said he, “I asked you to ride, kindly in the first place, when you refused; but at the second time of asking, I really intended to do as I have just done.” So saying, and tossing the bundle back, he rode on, leaving his companion to apply the moral as he thought best. I’m not sure how I feel about that story. It makes it seem like Quakers were the worst, especially Quakers who thought they were telepaths. On the other hand, John did dunk the Quaker into the river, but he didn’t end up stealing the Quaker’s bundle. This story does makes John seem like a really cool guy. First published August 25, 2015. While researching the last photo that I wrote about, I started thinking about a family portrait that I had. This picture was taken in Davenport, Iowa, so I assumed that it pictured my great-great-great-grandmother on the left, Sarah J. Husted, and her husband, Lyman B. Husted in the middle of the picture. The man in the back of the picture, who looks a lot like my father, I thought was my great-great-grandfather Lyman M. Husted. I figured the children were those of the woman on the right, who was a sister of Lyman M.
However, going through the steps to date Lyman B.’s previous photograph got me thinking that my initial assumptions were wrong. This sent me on a crazy chase to figure out who these people were in this picture. I found some old newspapers from Davenport, Iowa that showed a divorce between Sarah J. and Lyman B. I’m not sure if this divorce went through but she shows up in later newspaper articles remarried as Sarah J. Owens. However by 1900 she was going by Sarah J. Husted again. This might be because of inheritance money that was discovered in Connecticut (I’ll talk more about this in another post). Anyway, Lyman B. was 67 when he died and I do not think that this man in this photograph is 67. This indicates that her father was living with her at some point when he was older. He is also blind, and I might be reading too much into the picture, but he is not looking at the camera the way the other adults are. My next question to answer was: What year was Jehial Stanton born? This question actually took me awhile to figure out, probably because I had some wrong information. I originally thought his name was Jehral Staton, which I believe I acquired from an obituary of Sarah J. Husted. This made it hard to find any information, but once I started digging I found his correct name. 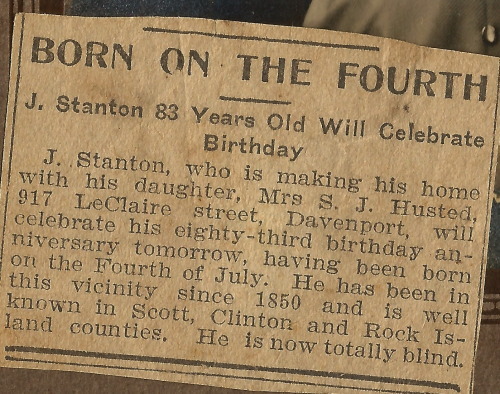 Jehial Stanton was born July 4th, 1823 (based on this clipping and census data). That means that this newspaper clipping was from July 3rd, 1906. So by 1906 he was living with his daughter in Davenport. I had a difficult time dating the fashion in this photo, but based on the women’s dresses, I think that it was taken sometime between 1900 and 1910. My next question to answer was: Who are the other people in the picture? However, I no longer think that the young man in this photo is Lyman M. Husted but rather his brother James Elnathan Husted, called Elnathan (also listed in this census). If both sons lived with Sarah J. at the time of this photo, I would think that they would both be in the photo. Finally, who is the woman and the children? Sarah J. Husted had no female children so my previous theory was wrong. I do not think that this woman is Elnathan’s wife, Lola Husted. On his World War I draft card Elnathan listed that his address was the same as his mother’s and his mother was his next of kin whereas on his World War II draft application, his address was in another state and his next of kin was Lola and this photograph was definitely take before World War I. 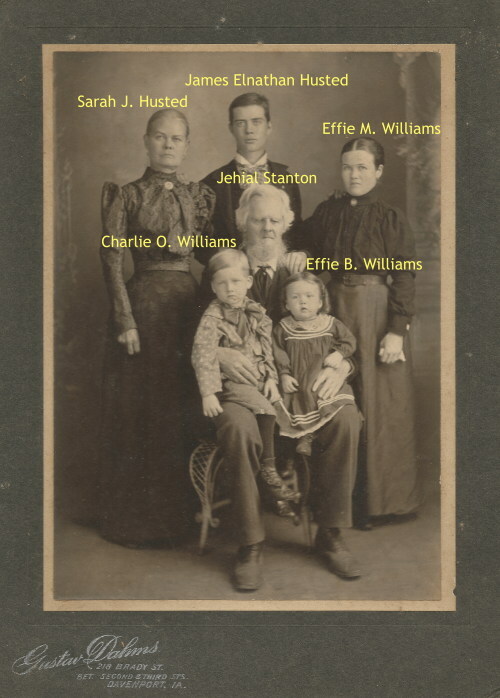 Looking back at the 1900 Federal Census, an Effie M. Williams, Sarah J.’s niece, and her children, Charlie O. Williams and Effie B. Williams, are listed as living with Sarah J. The children in this photo, if it was taken between 1900 and 1904, would be about the same age as Charlie O. and Effie B. and the woman on the right of the photo looks to be in her mid twenties, as Effie M. would be. Although I tried, I could not figure out who Effie M.’s parents were. So my conclusions at this point are that the people in this photo are Sarah J. Husted, James Elnathan Husted, Effie M. Williams, Jehial Stanton, Charlie O. Williams and Effie B. Williams. First published August 22, 2015. This is a photograph of Lyman B. Husted, or at least a photograph of someone with the name Lyman B. Husted written on the back. We found this photo in the box of pictures belonging to my great-grandmother, so I’m going to assume that this is indeed Lyman B. Husted, her grandfather and my great-great-great-grandfather. I was very excited to find this picture because it was very old, on a piece of metal and there was a name on the back. Recently I’ve been reading Family Photo Detective: Learn How to Find Genealogy Clues in Old Photos and Solve Family Photo Mysteries by Maureen Taylor. It is a very good resource and I thought I would use some of the techniques in the book to decode this picture. The bottom of the photograph is full of clues. “TIMPE”, I believe is the photographer and the picture was taken in Davenport, Iowa. Lyman B. was still living in Connecticut in 1860 according to the 1860 Federal Census. I’m not sure why he moved to Iowa, but he at least was there by 1877 when he married his wife, Sarah J. Staton, in Iowa. Lyman B. died in 1897, so I’m thinking that this photo was taken at some point between 1861 and 1897. This photo is a tintype photograph, which were introduced in 1856. They fell out of fashion by the end of the century because of the advent of paper photographs. This doesn’t help too much with dating the photo. Based on the information provided in Family Photo Detective about dating fashion I think that this picture was taken between 1860 and 1870. The collar looks like a standard folded down collar that is worn today. In the decade prior, men wore popped collars that almost touched their cheeks. In the decade after, men wore thicker collars. Also during this time period, men had facial hair and their hair was parted to the side and a little bit longer. Deciphering mens fashion is difficult so I could be totally wrong about this. However if this photo was taken in this period he would be between 30 and 40 years old, which I think is accurate based on how old he looks. I don’t know why Lyman B. took this photo or why he moved to Iowa, more family mysteries to solve. First published on October 31, 2015. First published August 16, 2015. In a box of pictures that belonged to my great-grandmother, I found some letters. This letter is from my great-great-grandmother, Lucy Lamb (highlighted in blue) to probably my great-great-great-grandmother Adella Bunnell (highlighted in yellow). She mentions “Mort” who is her husband, Lyman Mortimer Husted (highlighted in red). I’ve included a quick family tree to show these relationships. I thought that this letter was really fun to read and gave a good glimpse of like back in 1923. 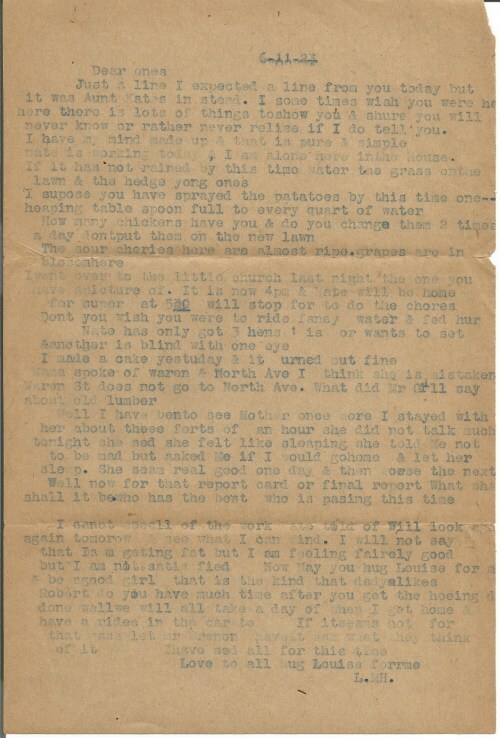 Here’s a scan of the letter, I will transcribe it below. Mort here Hope you will get along alright I have written most of this to Mort but you dont care if he reads it to you doyou? May has said more then once I wish I would be out there with Daddy. Now I have said more then Mort We are all well & tired. P.S. Mr Gill came tonight saying if you wanted old house lumber they are tearing down the houses on North Ave and Warren St. I know that “May” in the letter is my great grandmother, she would have been around 9 years-old at the time of this letter. I’m glad that her grades got better. “Robert” is my great great uncle, “May’s” brother. I’m not sure if “Mort” wrote this letter as Lucy dictated it. That would make the change in tenses more explainable. I also think that Mort is delivering the letter to Lucy’s mother, because she asks Mort to read the letter to her. I don’t know when Adella Bunnell Lamb died but perhaps she moved away from her family at this time, possibly with another one of her children, because Lucy asks her how she is feeling in the “different air”. Hopefully as I post more pictures from my great grandmother’s box, I’ll be able to link those to the people mentioned in this letter.